Slowly and eventually we have reached at the end of 2014. it's the time to look back and reflect on our favorite moments, also to look forward with new hope and wishes. As some wise man said, 'Tomorrow, is the first blank page of a 365 page book. Write a good one". It's been a good year for us. We finally visited India after two years of gap, which were being cancelled or postponed for a while. We had fun with our near and dear ones, both at home and abroad. Thanks to my San Diego friends for inviting to many memorable parties and get-togethers. When it comes to my blog, I received huge appreciations and love from my readers. So my sincere thanks to all of you who made my year so colorful and exciting. During the last month I baked several types of Christmas Cake and cookies following different recipes. Few of them are for our tea time snacks and others were for the parties in our friend's places. Both me and my family love to have these cakes. The Christmas time is a great excuse for preparing and having cakes. 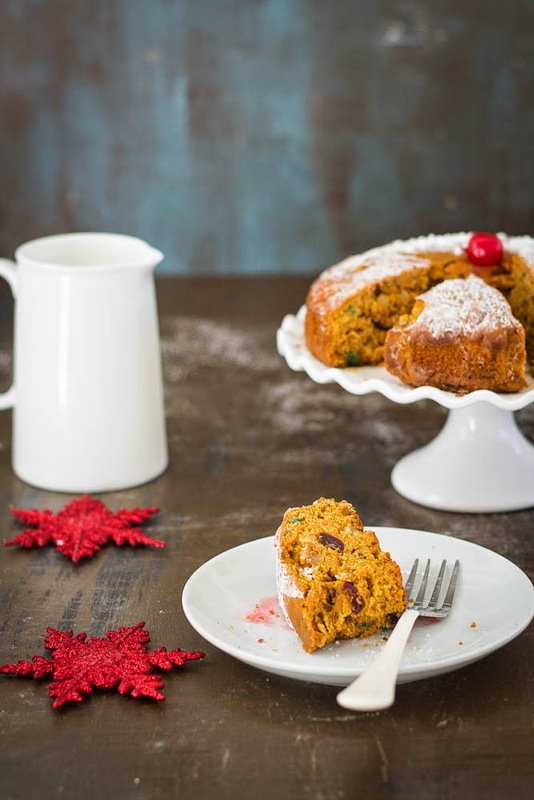 Today I will share the recipe of a Christmas Cake that I tried first time this season. 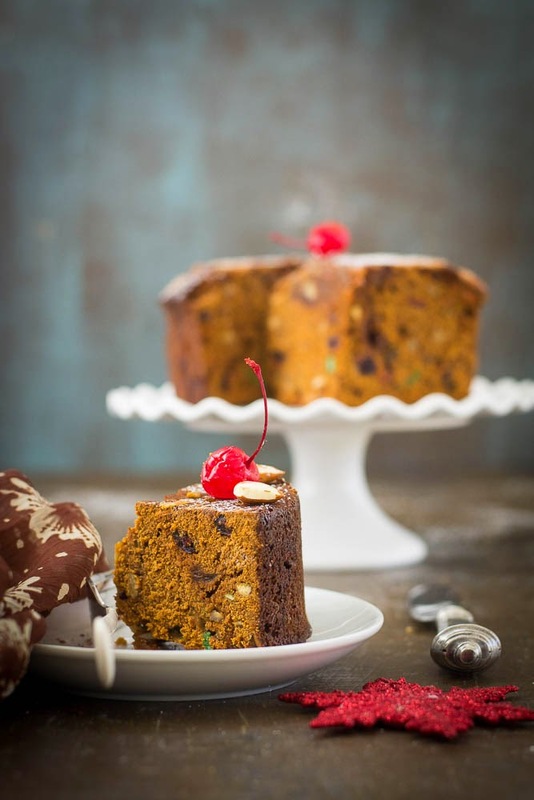 What is special about this cake is that I have added garam masala with the traditional method of making a Rich Fruit Cake. The combination makes it more delicious. There was a time at our home on the Christmas day when my mom used to prepare a cake with the small electric cake oven and everybody used to be so delighted when it came out of the kitchen. I can't recall its taste now but can remember the smell which used to make the whole house aromatic. Other than that, Christmas in our childhood was not complete without orange and the Fruit Cake ordered from Park Street's bakery Shops. 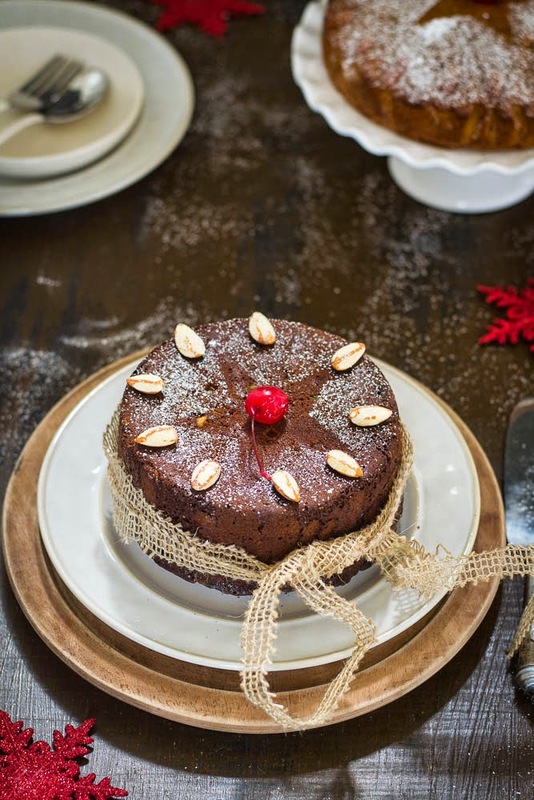 Christmas cake is a tradition that started way back in nineteenth century. Originally people used to eat a type of porridge on Christmas Eve. After a day's of fasting on Christmas Eve, it was the dish to fill their stomachs. Gradually people added dried fruit, spices and honey to the porridge mixture together. 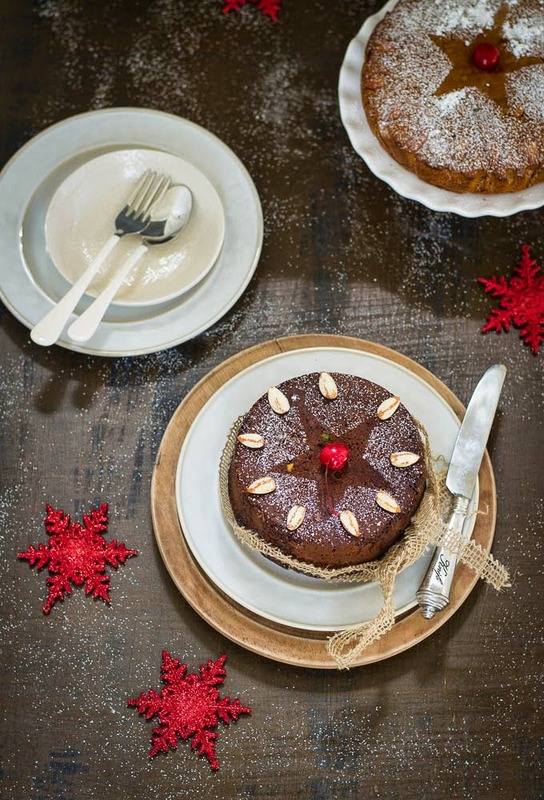 Christmas cakes are made in different shapes with frosting, glazing, a dusting of confectioner's sugar or plain. There are different variations with very little difference in the process. Christmas cakes are generally made in advance. 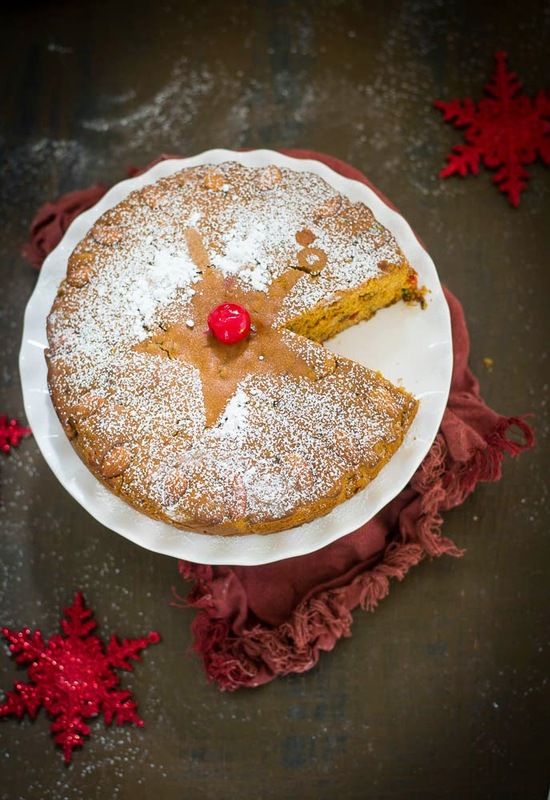 Many people make the cake in November and keep it up side down in an airtight container, Then they poke the cake and brush it with sherry or whisky every week until Christmas. Interestingly the method is called "feeding" the cake. 1. Chop all the dry fruits, raisins add rum to it. Cover and let it soak for a day or two and give stirs a few time during the day. 2. In a dry grinder, take the whole spices and grind it into a powder. Keep it aside. 3. Take a pan, add 1/2 cup of sugar and melt it slowly on medium heat. Keep stirring and let it change color into deep dark brown. Turn off the heat and add 1/4 cup of water. The sugar will harden. Turn on the heat again. Slowly heat it up until the mixture dissolves. It will take 5 to 8 minutes. Once done, set it aside. 4. Preheat the oven to 350 degrees F / 180 degrees C.
5. Sieve the flour, baking powder, salt and powdered spice mix. 6. Take a mixing bowl, add butter and 1 cup of sugar and beat it until it becomes fluffy. Add eggs, one at a time and beat again. Add vanilla extract and mix it. Gradually add the flour mixture and beat until incorporated. 7. Add the fruits and nuts, add the caramel and gently fold in. 8. Pour the batter evenly into the prepared pan and decorate the top with almonds. Bake for about 50 to 60 minutes or until a toothpick inserted into the center of the cake comes out clean. 9. Remove from the oven and let it cool down on a wire rack. Once it is at room temperature remove from it from the pan and dust with icing sugar. Use Rum only if you like your cake to have a boozy flavor, Otherwise make it alcohol free. You may make the cake a month ahead and keep it up side down in an airtight container, Then poke the cake and brush it with rum / sherry or whisky every week until Christmas.